Politics had become a regular and profitable business, and politicians were more than suspected of being corrupt. It was reported and currently believed that the sheriff (Scannell) had been required to pay the Democratic Central Committee a hundred thousand dollars for his nomination, which was equivalent to an election, for an office of the nominal salary of twelve thousand dollars a year for four years. In the election all sorts of dishonesty was charged and believed, especially of ballot-box stuffing, and too generally the better classes avoided the elections and dodged jury-duty, so that the affairs of the city government necessarily passed into the ands of a low set of professional politicians. Among them was a man named James Casey, who edited a small paper, the printing office of which was in a room on the third floor of our banking-office. I hardly knew him on sight if ever saw his paper; but one day Mr. Sather, of the excellent banking firm of Drexel, Sather & Church, came to me, and called my attention to an article in Caseys paper so full of falsehood and malice, that we construed it as an effort to black-mail the banks generally. At that time we were all laboring to restore confidence, which had been so rudely shaken by the panic, and I went up-stairs, found Casey, and pointed out to him the objectionable nature of his article, told him plainly that I could not tolerate his attempt to print and circulate slanders in our building, and, if he repeated it, I would cause him and his press to be thrown out of the windows. He took the hint and moved to more friendly quarters. I mention this fact, to show my estimate of the man, who became a figure in the drama I am about to describe. James King of Wm., as before explained was in 1853 a banker on his own account, but some time in 1854 he had closed out his business, and engaged with Adams & Co., as cashier. When his firm failed, he, in common with all the employés, was thrown out of employment, and had to look around for something else. He settled down to the publication of an evening paper, called the Bulletin, and, being a man of fine manners and address, he at once constituted himself the champion of society against the public and private characters whom he saw fit to arraign. As might have been expected, this soon brought him into the usual newspaper war with other editors, and especially with Casey, and epithets á la Eatanswill were soon bandying back and forth between them. One evening of May, 1856, King published, in the Bulletin, copies of papers procured from New York, to show that Casey had once been sentenced to the State penitentiary at Sing Sing. 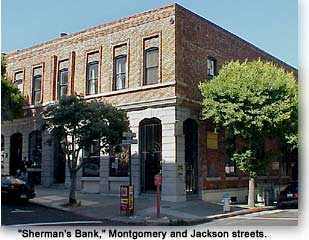 Casey took mortal offense, and called at the Bulletin office, on the corner of Montgomery and Merchant Streets, where he found King, and violent words passed between them, resulting in Casey giving King notice that he would shoot him on sight. King remained in his office till about 5 or 6 p.m., when he started toward his home on Stockton Street, and, as he neared the corner of Washington, Casey approached him from the opposite direction, called to him, and began firing. King had a short cloak, and in his breast-pocket a small pistol, which he did not use. One of Caseys shots struck him high in the breast, from which he reeled, was caught by some passing friend, and carried into the express-office on the corner, where he was laid on the counter, and a surgeon sent for. Casey escaped up Washington Street, went to the City Hall, and delivered himself to the sheriff (David Scannell), who conveyed him to jail and locked him in a cell. Meantime, the news spread like wildfire, and all the city was in commotion, for King was very popular. Nisbet, who boarded with us on Harrison Street, had been delayed at the bank later than usual, so that he happened to be near at the time, and, when he came out to dinner, he brought me the news of this at there was every appearance of a riot down-town that night. This occurred toward the evening of May 14, 1856. It so happened that, on the urgent solicitation of Van Winkle and Governor Johnson, I had only a few days before agreed to accept the commission of major-general of the Second Division of Militia, embracing San Francisco. I had received the commission, but had not as yet formally accepted it, or even put myself in communication with the volunteer companies of the city. Of these, at that moment of time, there was a company of artillery with four guns, commanded by a Captain Johns, formerly of the army, and two or three uniformed companies of infantry. After dinner I went down-town to see what was going on; found that King had been removed to a room in the Metropolitan Block [Montgomery Block]; that his life was in great peril; that Casey was safe in jail, and the sheriff had called to his assistance a posse of city the city police, some citizens, and one of the militia companies. The people were gathered in groups on the streets, and the words Vigilance Committee were freely spoken, but I saw no signs of immediate violence. The next morning, I again went to the jail, and found all things quiet, but the militia had withdrawn. I then went to the City Hall, saw the mayor, Van Ness, and some city officials, agreed to do what I could to maintain order with such militia as were on hand, and then formally accepted the commission, and took the oath. In 1851 (when I was not in California) there had been a Vigilance Committee, and it was understood that its organization still existed. All the newspapers took ground in favor of the Vigilance Committee, except the Herald (John Nugent, editor), and nearly all the best people favored that means of redress. I could see they were organizing, hiring rendezvous, collecting arms, etc., without concealment. It was soon manifest that the companies of volunteers would go with the committee, and that the public authorities could not rely on them for aid or defense. Still, there were a good many citizens who contended that, if the civil authorities were properly sustained by the people at large, they could and would execute the law. But the papers inflamed the public mind, and the controversy spread to the country. About the third day after the shooting of King, Governor Johnson telegraphed me that he would be down in the evening boat, and asked me to meet him on arrival for consultation. I got C.K. Garrison to go with me, and we met the Governor and his brother on the wharf, and walked up to the International Hotel on Jackson Street, above Montgomery. We discussed the state of affairs fully; and Johnson, on learning that his particular friend, William T. Coleman, was president of the Vigilance Committee, proposed to go and see him. En route, we stopped at Kings room, ascertained that he was slowly sinking, and could not live long; and then near midnight we walked to the Turnverein Hall, where the committee was known to be sitting in consultation. This hall was on Bush Street, at about the intersection of Stockton. It lighted up within, but the door was locked. The Governor knocked at the door, and in inquiry from insideWhos there?gave his name. After some delay we were admitted into a sort of vestibule, beyond which was a large hall, and we could hear the suppressed voices of a multitude. We were shown into a bar-room to the right, when the Governor asked to see Coleman. The man left us, went into the main hall, and soon returned with Coleman, who was pale and agitated. After shaking hands all round, the Governor said, Coleman, what the devil is the matter here? Coleman rejoined that the people were tired of it, and had no faith in the officers of the law. A general conversation then followed, in which it was admitted that King would die, and that Casey must be executed; but the manner of execution was the thing to be settled, Coleman contending that the people would do it without trusting the courts or the sheriff. It so happened that at that time Judge Norton was on the bench of the court having jurisdiction, and he was universally recognized as an able and upright man, whom no one could or did mistrust; and it also happened that a grand-jury was then in session. Johnson argued that the time had passed in California for mobs and vigilance committees, and said if Coleman and his associates would use their influence to support the law, he (the Governor) would undertake that, as soon as King died, the grand-jury should indict, that Judge Norton would try the murderer, and the whole proceeding should be as speedy as decency would allow. Then Coleman said the people had no confidence in Scannell, the sheriff, who was, he said, in collusion with the rowdy element of San Francisco. Johnson then offered to be personally responsible that Casey should be safely guarded, and should be forthcoming for trial and execution at the proper time. I remember very well Johnsons asserting that he had no right to make these stipulations, and maybe no power to fulfill them; but he did it to save the city and state from the disgrace of a mob. Coleman disclaimed that the vigilance organization was a mob, admitted that the proposition of the Governor was fair, and all he or any one should ask; and added, if we would wait awhile, he would submit it to the council, and bring back an answer. We waited nearly an hour, and could hear the hum of voices in the hall, but no words, when Coleman came back, accompanied by a committee, of which I think the two brothers Arrington, Thomas Smiley the auctioneer, Seymour, Truett, and others, were members. The whole conversation was gone over again, and the Governors proposition was positively agreed to, with this further condition, that the Vigilance Committee should send into the jail a small force of their own men, to make certain that Casey should not be carried off or allowed to escape. The Governor, his brother William, Garrison, and I, then went up to the jail, where we found the sheriff and his posse-comitatus of police and citizens. These were styled the Law-and-Order party, and some of them took offense that the Governor should have held communication with the damned rebels, and several of them left the jail; but the sheriff seemed to agree with the Governor that what he had done was right and best; and, while we were there, some eight or ten armed men arrived from the Vigilance Committee, and were received by the sheriff (Scannell) as part of his regular posse. The Governor then, near daylight, went to his hotel, and I to my house for a short sleep. 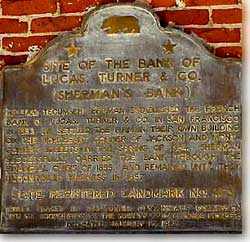 Next day I was at the bank, as usual, when about noon the Governor called, and asked me to walk with him down-street. He said he had just received a message from the Vigilance Committee to the effect that they were not bound by Colemans promise not to do any thing till the regular trial by jury should be had, etc. He was with reason furious, and asked me to go with him to Truetts store, over which the Executive Committee was said to be in session. We were admitted to a front-room up-stairs, and heard voices in the back-room. The Governor inquired for Coleman, but he was not forthcoming. Another of the committee, Seymour, met us, denied in toto the promise of the night before, and the Governor opening accused him of treachery and falsehood. The quarrel became public, and the newspapers took it up, both parties turning on the Governor, one, the Vigilantes, denying the promise made by Coleman, their president; and the other, the Law-and-Order party, refusing any further assistance, because Johnson had stooped to make terms with rebels. At all events, he was powerless, and had to let matters drift to a conclusion. 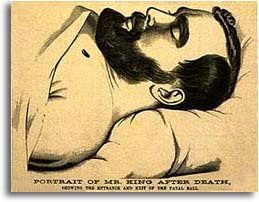 King died about Friday, May 20th, and the funeral was appointed for the next Sunday. Early on that day the Governor sent for me at my house. I found him on the roof of the International, from which we looked down on the whole city, and more especially the face of Telegraph Hill, which was already covered with a crowd of people, while others were moving toward the jail on Broadway. Parties of armed men, in good order, were marching by platoons in the same direction, and formed in line along Broadway, facing the jail-door. Soon a small party was seen to advance to this door, and knock; a parley ensued, the door was opened, and Casey was led out. In a few minutes another prisoner was brought out, who proved to be [Charles] Cora, a man who had once been tried for killing Richardson, the United States Marshal, when the jury disagreed, and he was awaiting a new trial. These prisoners were placed in carriages, and escorted by the armed force down to the rooms of the Vigilance Committee, through the principal streets of the city. The day was exceedingly beautiful, and the whole proceeding was orderly in the extreme. I was under the impression that Casey and Cora were hanged that same Sunday, but was probably in error; but in a very few days they were hanged by the neckdeadsuspended from beams projecting from the windows of the committees rooms, without other trial than could be given in secret, and by night. We all though the matter had ended there, and accordingly the Governor returned to Sacramento in disgust, and I went about my business. But it soon became manifest that the Vigilance Committee had no intention to surrender the power thus usurped. They took a building on Clay Street, near Front [Sacramento St., between Front and Davis], fortified it, employed guards and armed sentinels, sat in midnight council, issued writs of arrest and banishment, and utterly ignored all authority but their own. A good many men were banished and forced to leave the country, but they were of that class we could well spare. Yankee Sullivan, a prisoner in their custody, committed suicide, and a feeling of general insecurity pervaded the city. Business was deranged; and the Bulletin, then under control of Tom King, a brother of James, poured out its abuse on some of our best men, as well as the worst. Governor Johnson, being again appealed to, concluded to go to work regularly, and telegraphed me about the 1st of June to meet him at [U.S. Army] General Wools headquarters at Benicia that night. I went up, and we met at the hotel where General Wool was boarding. Johnson had with him his Secretary of State. We discussed the state of the country generally, and I agreed that if Wool would give us arms and ammunition out of the United States Arsenal at Benicia, and if Commodore Farragut, of the navy, commanding the navy-yard at Mare Island, would give us a ship, I would call out the volunteers, and, when a sufficient number had responded, I would have the arms come down from Benicia in the ship, arm my men, take possession of a thirty-two-pound-gun battery at the Marine Hospital on Rincon Point, thence command a dispersion of the unlawfully-armed force of the Vigilance Committee, and arrest some of the leaders. We played cards that night, carrying on a conversation, in which Wool insisted on a proclamation commanding the Vigilance Committee to disperse, etc., and he told us how he had on some occasion, as far back as 1814, suppressed a mutiny on the Northern frontier. I did not understand him to make any distinct promise of assistance that night, but he invited us to accompany him on an inspection of the arsenal the next day, which we did. On handling some rifled muskets in the arsenal storehouse he asked me how they would answer our purpose. I said they were the very things, and that we did not want cartridge boxes or belts, but that I would have the cartridges carried in the breeches-pockets, and the caps in the vest-pockets. I knew that there were stored in that arsenal four thousand muskets, for I recognized the boxes which we had carried out in the Lexington around Cape Horn in 1846. Afterward we all met at the quarters of Captain D.R. Jones of the army, and I saw the Secretary of State, D.F. Douglass, Esq., walk out with General Wool in earnest conversation, and this Secretary of State afterward asserted that Wool there and then promised us the arms and ammunition, provided the Governor would make his proclamation for the committee to disperse, and that I should afterward call out the militia, etc. On the way back to the hotel at Benicia, General Wool, Captain Callendar of the arsenal, and I, were walking side by side, and I was telling him (General Wool) that I would also need some ammunition for the thirty-two-pound guns then in position at Rincon Point, when Wool turned to Callendar and inquired, Did I not order those guns to be brought away? Callendar said: Yes, general. I made a requisition on the quartermaster for transportation, but his schooner has been so busy that the guns are still there. Then said Wool: Let them remain; we may have use for them. I therefrom inferred, of course, that it was all agreed to so far as he was concerned. Soon afterward we had reached the hotel, we ordered a buggy, and Governor Johnson and I drove to Vallejo, six miles, crossed over to Mare Island, and walked up to the commandants house, where we found Commodore Farragut and his family. We stated our business fairly, but the commodore answered very frankly that he had no authority, without orders from his department, to take any part in civil broils; he doubted the wisdom of the attempt; said he had no ship available except the John Adams, Captain Boutwell, and that she needed repairs. But he assented at last to the proposition to let the sloop John Adams drop down abreast of the city after certain repairs, to lie off there for moral effect, which afterward actually occurred. We then returned to Benicia, and Wools first question was, What luck? We answered, Not much, and explained what Commodore Farragut could and would do, and that, instead of a naval vessel, we would seize and use one of the Pacific Mail Companys steamers, lying at their dock in Benicia, to carry down to San Francisco the arms and munitions when the time came. As the time was then near at hand for the arrival of the evening boats, we all walked down to the wharf together, where I told Johnson that he could not be too careful; that I had not heard General Wool make a positive promise of assistance. Upon this, Johnson called General Wool to one side, and we three drew together. Johnson said: General Wool, General Sherman is very particular, and wants to know exactly what you proposed to do. Wool answered: I understand, Governor, that in the first place a write of habeas corpus will be issued commanding the jailers of the Vigilance Committee to produce the body of some one of the prisoners held by them (which, of course, will be refused); that you then issue your proclamation commanding them to disperse, and, failing this, you will call out the militia, and command General Sherman with it to suppress the Vigilance Committee as an unlawful body; to which the Governor responded, Yes. Then, said Wool, on General Shermans making his requisition, approved by you, I will order the issue of the necessary arms and ammunition. I remember well that I said, emphatically: That is all I want.Now, Governor, you may go head. We soon parted; Johnson and Douglas taking the boat to Sacramento, and I to San Francisco. The Chief-Justice, [David S.] Terry, came to San Francisco the next day to issue a writ of habeas corpus for the body of one Maloney, which writ was resisted, as we expected. The Governor then issued his proclamation, and I published my orders, dated June 4, 1855. The Quartermaster-General of the State, General Kibbe, also came to San Francisco, took an office in the City Hall, engaged several rooms for armories, and soon the men began to enroll into companies. In my general orders calling out the militia, I used the expression, When a sufficient number of men are enrolled, arms and ammunition will be supplied. Some of the best men of the Vigilantes came to me a remonstrated, saying that collision would surely result; that it would be terrible, etc. All I could say in reply was, that it was for them to get out of the way. Remove your fort; cease your midnight councils; and prevent your armed bodies from patrolling the streets. They inquired where I was to get arms, and I answered that I had them certain. But personally I went right along with my business at the bank, conscious that at any moment we might have trouble. Another committee of citizens, a conciliatory body, was formed to prevent collision if possible, and the newspapers boiled over with vehement vituperation. This second committee was composed of such men as Crockett, Ritchie, Thornton, Bailey Payton, Foote, Donohue, Kelly, and others, a class of the most intelligent and wealthy men of the city, who earnestly and honestly desired to prevent bloodshed. They also came to me, and I told them that our men were enrolling very fast, and that, when I deemed the right moment had come, the Vigilance Committee must disperse, else bloodshed and destruction of property would inevitably follow. They also had discovered that the better men of the Vigilance Committee itself were getting tired of the business, and thought that in the execution of Casey and Cora, and the banishment of a dozen or more rowdies, they had done enough, and were then willing to stop. It was suggested that, if our Law-and-Order party would not arm, by a certain day near at hand the committee would disperse, and some of their leaders would submit to an indictment and trial by a jury of citizens, which they knew would acquit them of crime. One day in the bank a man called me to the counter and said, If you expect to get arms of General Wool, you will be mistaken, for I was at Benicia yesterday, and heard him say he would not give them. This person was known to me to be a man of truth, and I immediately wrote to General Wool a letter telling him what I had heard, and how any hesitation on his part would compromise me as a man of truth and honor; adding that I did not believe we should ever need the arms, but on the promise of them, for the committee was letting down, and would soon disperse and submit to the law, etc. I further asked him to answer me categorically that very night, by the Stockton boat, which would pass Benicia on its way down about midnight, and I would sit up and wait for his answer. I did wait for his letter, but it did not come, and the next day I got a telegraphic dispatch from Governor Johnson, who, at Sacramento, had heard of General Wools back-down, asking me to meet him again at Benicia that night. I went up in the evening boat, and found General Wools aide-de-camp, Captain Arnold, of the army, on the wharf, with a letter in his hand, which he said was for me. I asked for it, but he said he knew of its importance, and preferred we should go to General Wools room together, and the general could had it to me in person. We did go right up to General Wools, who took the sealed parcel and laid it aside, saying that it was literally a copy of one he had sent to Governor Johnson, who would doubtless give me a copy; but I insisted that I had made a written communication, and was entitled to a written answer. At that moment several gentlemen of the Conciliation party, who had come up in the same steamer with me, asked for admission and came in. I recall the names of Crockett, Foote, Bailey Peyton, Judge Thornton, Donohue, etc., and the conversation became general, Wool trying to explain away the effect of our misunderstanding, taking good pains not to deny his promise made to me personally on the wharf. I renewed my application for the letter addressed to me, then lying on his table. On my statement of the case, Bailey Peyton said, General Wool, I think General Sherman has a right to a written answer from you, for he is surely compromised. Upon this Wool handed me the letter. I opened and read it, and it denied any promise of arms, but otherwise was extremely evasive and non-committal. I had heard of the arrival at the wharf of the Governor and party, and was expecting them at Wools room, but, instead of stopping at the hotel where we were, they passed to another hotel on the block above. I went up and found there, in a room on the second floor over the bar-room, Governor Johnson, Chief-Justice Terry, Jones, of Palmer, Cooke & Co., E.D. Baker, Volney E. Howard, and one or two others. All were talking furiously against Wool, denouncing him as a dd liar, and not sparing the severest terms. I showed the Governor General Wools letter to me, which he said was in effect the same as the one addressed to and received by him at Sacramento. He was so offended that he would not even call on General Wool, and said he would never again recognize him as an officer or gentleman. We discussed matters generally, and Judge Terry said that the Vigilance Committee was a set of dd pork-merchants; that they were getting scared, and that General Wool was in collusion with them to bring the State into contempt, etc. I explained that there were no arms in the State except what General Wool had, or what were in the hands of the Vigilance Committee of San Francisco, and that the part of wisdom for us was to be patient and cautious. About that time Crockett and his associates sent up their cards, but Terry and the more violent of the Governors followers denounced them as no better than "Vigilantes, and wanted the Governor to refuse even to receive them. I explained that they were not Vigilantes, that Judge Thornton was a Law-and-Order man, was one of the first to respond to the call of the sheriff, and that he went actually to the jail with his one arm the night we expected the first attempt at rescue, etc. Johnson then sent word for them to reduce their business to writing. They simply sent in a written request for an audience, and they were then promptly admitted. After some general conversation, the Governor said he was prepared to hear them, when Mr. Crockett rose and made a prepared speech embracing a clear and fair statement of the condition of things in San Francisco, concluding with the assertion of the willingness of the committee to disband and submit to trial after a certain date not very remote. All the time Crockett was speaking, Terry said with his hat on, drawn over his eyes, and with his feet on a table. As soon as Crockett was through, they were dismissed, and Johnson began to prepare a written answer. This was scratched, altered, and amended, to suit the notions of his counselors, and at last was copied and sent. This answer amounted to little or nothing. Seeing that we were powerless for good, and that violent counsels would prevail under the influence of Terry and others, I sat down at the table, and wrote my resignation, which Johnson accepted in a complimentary note on the spot, and at the same time he appointed to my place General Volney E. Howard, then present, a lawyer who had once been a member of Congress from Texas, and who was expected to drive the dd pork-merchants into the bay at short notice. I went soon after to General Wools room, where I found Crockett and the rest of his party; told them that I was out of the fight, having resigned my commission; that I had neglected business that had been intrusted to me by my St. Louis partners; and that I would thenceforward mind my own business, and leave public affairs severely alone. we all returned to San Francisco that night by the Stockton boat, and I never afterward had any thing to do with politics in California, perfectly satisfied with that short experience. Johnson and Wool fought out their quarrel of veracity in the newspaper and on paper. But, in my opinion, there is not a shadow of doubt that General Wool did deliberately deceive us; that he had authority to issue arms, and that, had he adhered to his promise, we could have checked the committee before it became a fixed institution, and a part of the common law of California. Major-General Volney E. Howard came to San Francisco soon after; continued the organization of the militia which I had begun; succeeded in getting a few arms from the country; but one day the Vigilance Committee sallied from their armories, captured the arms of the Law-and-Order party, put some of their men into prison, while General Howard, with others, escaped to the country; after which the Vigilance had it all their own way. Subsequently, in July, 1856, they arrested Chief-Justice Terry, and tried him for stabbing one of their constables, but he managed to escape at night, and took refuge on the John Adams. In August, they hanged Hetherington and Brace in broad daylight, without any jury-trial; and, soon after, they quietly disbanded. As they controlled the press, they wrote their own history, and the world generally gives them the credit of having purged San Francisco of rowdies and roughs; but their success has given great stimulus to a dangerous principle, that would at any time justify the mob in seizing all the power of government; and who is to say that the Vigilance committee may not be composed of the worst, instead of the best, elements of a community? Indeed, in San Francisco, as soon as it was demonstrated that the real power had passed from the City Hall to the committee-room, the same set of bailiffs, constables, and rowdies that had infested the City Hall were found in the employment of the Vigilantes; and, after three months experience, the better class of people became tired of the midnight sessions and left the business and power of the committee in the hands of a court, of which a Sydney man was reported to be the head or chief-justice.